Milos Vilotic My Statistical Consultant Ltd.
Research background: One of business cycles stylised facts is that contractions are shorter than expansions, but less persistent, more volatile, and therefore asymmetric. Investigating existence and type of business cycles asymmetry is important for analysis of economic policy and statistical modelling. Economic implication of business cycles asymmetry is that economic policy should be different in a period of contractions than in one of expansion. Statistical implication is that linear models of business cycles cannot capture this stylised fact. Purpose of the article: The article has two objectives: extend the literature on the business cycles asymmetry by testing data from 36 European countries including countries never been analysed before and test robustness of the results to extraction methods and asymmetry tests used. Methods: Quarterly GDP series from Eurostat database covering period 2000q1–2016q3 were used with two exceptions. In the case of Bosnia and Herzegovina and Montenegro quarterly industrial productions indexes were used. Series were prepared by removing seasonal component using X13-ARIMA procedure. To assess robustness of asymmetry tests results to alternative methods of detrending business cycles were extracted using two filters: Corbae-Ouliaris ideal band filter and double Hodrick-Prescott filter. For testing the deepness and steepness asymmetry of the business cycles three tests were used: Mills, Mira and Sichel tests. Findings & value added: Weaker evidence of deepness asymmetry was found in Cyprus, Montenegro and Turkey cycles, where all three tests statistics for both filters have a negative sign. However, only for one of the tests in each country the result was statistically significant. For two other countries, Germany and Sweden, four out of six tests indicated deepness asymmetry, but only one of these tests results was statistically significant. Most of the cycles show steepness asymmetry, with the exception of Ireland business cycles, and to a certain extent cycles of Poland, Malta, Montenegro and Spain. Agénor, P-R., McDermott, C. J., & Prasad, E. S. (2000). Macroeconomic fluctua-tions in developing countries: Some stylized facts. World Bank Economic Re-view, 14(2). doi: 10.1093/wber/14.2.251. Astolfi, R., Gamba, M., & Guidetti, E. (2015). International evidence on business cycles asymmetries using the OECD composite leading indicators. OECD Sta-tistics Working Papers, OECD Publishing, Paris. Calderón, C., & Fuentes, J. R. (2014). Have business cycles changed over the last two decades? An empirical investigation. Journal of Development Economics, 109. doi: 10.1016/j.jdeveco.2014.03.001. Chirila, V. (2012). Testing the cyclical asymmetries in the Romanian macroeco-nomic data. Procedia - Social and Behavioral Sciences, 62. doi: 10.1016/j.sbspro.2012.09.154. Chirila, V., & Chirila, C. (2012). Testing business cycles asymmetry in Central and Eastern European countries. Modern Economy, 3. doi: 10.4236/me.2012.36091. Clements, M. P., & Krolzig, H. M. (2003). Business cycle asymmetries: Character-izing and testing based on Markov-switching autoregression. Journal of Busi-ness and Economic Statistics, 21. doi: 10.1198/073500102288618892. Corbae, D., & Ouliaris, S. (2006). Extracting cycles from a non-stationary data. In P. C. B. Phillips, D. Corbae, S. N. Durlauf & B. E. Hansen (Eds.). Econometric theory and practice: frontiers of analysis and applied research. Cambridge, UK: Cambridge University Press. Hodrick, R. J., & E. C. Prescott, E. C. (1980). Postwar US business cycles: an empirical investigation. Carnegie Mellon University discussion paper, 451. Kaiser, R., & Maravall, A. (2001). Measuring business cycles in economic time series. Lecture Notes in Statistics 154. New York: Springer. Konstantakopoulou, I., & Tsionas, E. G. (2014). Half a century of empirical evi-dence of business cycles in OECD countries. Journal of Policy Modeling, 36. doi: 10.1016/j.jpolmod.2014.01.006. Male, R. (2010). Developing country business cycles: revisiting the stylised facts. Working Paper 664. Queen Mary, University of London. Manap, T. A. A. (2010). An empirical assessment of business cycle asymmetries: evidence from Malaysia. International Journal of Business and Society, 11(1). Massmann, M., Mitchell, J., & Weale, M. (2003). Business cycles and turning points: a survey of statistical techniques. National Institute Economic Review, 183. doi: 10.1177/0027950103183001465. Mejia-Reyes, P., & Diaz-Carreño, M. A. (2010). Looking for asymmetries over the Mexican business cycle. Investigación Económica, 69(271). Mills, T. C. (2001). Business cycle asymmetry and duration dependence: an inter-national perspective. Journal of Applied Statistics, 28(6). doi: 10.1080/02664760120059246. Mira, A. (1999). Distribution-free test for symmetry based on Bonferroni’s meas-ure. Journal of Applied Statistics, 26(8). doi: 10.1080/02664769921963. Phillips, P. C. B., & Hin, S. (2015). Business cycles, trend elimination, and the HP filter. Cowles Discussion Paper, Yale University, 2005. Rand, J., & Tarp, F. (2002). Business cycles in developing countries: are they dif-ferent? World Development, 30(12). doi: 10.1016/S0305-750X(02)00124-9. Sichel, D. E. (1993). Business cycle asymmetry: a deeper look. 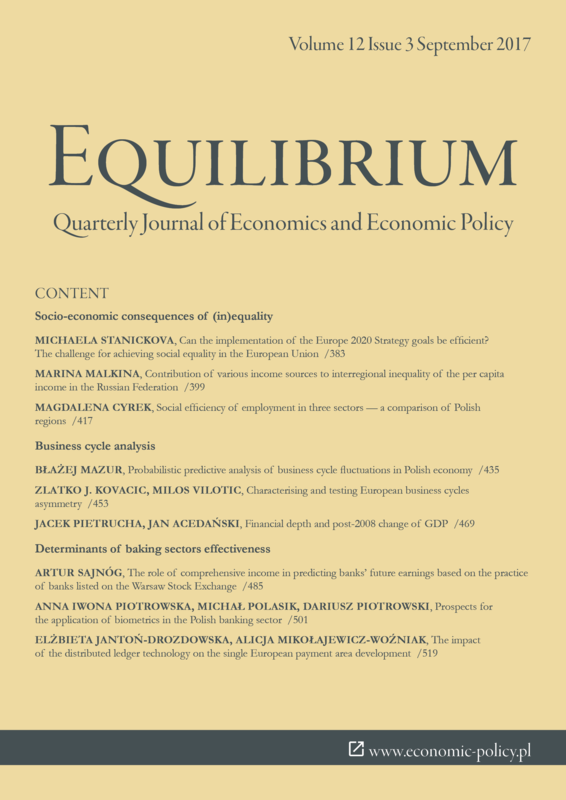 Economic Inquiry, 31. doi: 10.1111/j.1465-7295.1993.tb00879.x. Tanrıöver, B., & Yamak, R. (2015). Business cycle asymmetry: deepness and steepness in Turkey. Romanian Economic Journal, 18(58). Yilanci, V. (2012). Investigating asymmetries in macroeconomic aggregates of Central and Eastern European countries. Amfiteatru Economic, 14(31).